I created this blog because I believe there’s a lot of room for improvement in how companies treat their customers, and that a focus on the customer experience will serve both the company and the customer. But I didn’t realize how badly some companies need this advice. If the incident I’m about to share with you was portrayed in a movie, viewers would think it’s too fictitious. But it took place. In the real world. By a company that should’ve known better. I think an entire book can be dedicated to this one incident, but I’ll save you the hours of reading with this shorter serving. Mark from 248am.com, possibly the most popular blog in Kuwait, shared his own experience of the newly-opened Benihana Japanese restaurant in Kuwait. He thought the service was good, but the food was terrible. And it turns out the food isn’t the worst thing the company has to offer. Somebody at Benihana decided to improve the company’s reputation by posting a string of fake reviews that praised the restaurant’s food and service. 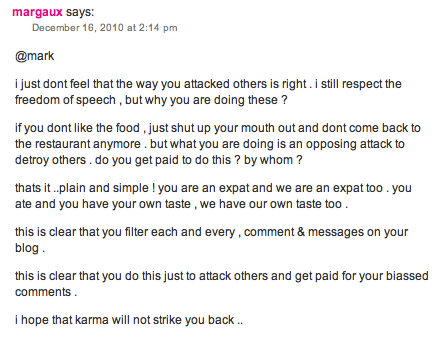 I should point out that commenters usually link to their own site, but this commenter “margaux” was linking to aol.com. It seems to me that the commenter is absolutely clueless about blogging that he (or she) felt obliged to include a URL in the comment form, and so gave a generic link. In addition to the fake reviews above, Benihana decided to add another “voice” to the conversation. This time linking to yahoo.com. 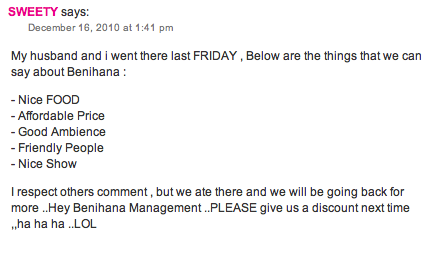 To appeal to a wider audience, Benihana decided to include a fake review from an Indian customer. Mark blew Benihana’s cover, and pointed out that the commenters are, in fact, the same Internet user, even though it’s not too hard to realize that the reviews are fake to begin with. Rather than admit their fault, Benihana decided to condemn Mark for posting a negative review, which could hurt their business. Telling your customer to “shut up your mouth out” will do more damage to your business than any negative review could ever do. I think that’s a universal law, as true as gravity itself. Although the comments above don’t necessarily point to Benihana (since they could’ve been posted by someone who doesn’t like the way Mark’s reviews influence his readers), the following comment is an official statement from Benihana. I don’t know about you, but I find this letter extremely offensive (but amusing at the same time. In a tragic kind of way, of course). Several readers chimed in, and many criticized the way Benihana handled the review, citing Benihana’s actions as their reason for not visiting the restaurant. How does Benihana choose to respond? What Mr Servo failed to realize is that customers don’t simply judge a company by the service they provide. Benihana could have the best food and eating experience known to Man (and Woman), but customers also care about the overall approach a company takes in dealing with customers. A negative review reveals what a company prioritizes. Do they care more about their reputation or their customers? Are they willing to incorporate the feedback they receive to improve their service, or will they defend their service at the expense of their customers? Mark revealed on Twitter that Benihana is going through with lawsuit, which will be hurting their reputation even more. Companies make mistakes. All the time. And there’s no shame in admitting when a mistake has been made, and to try and correct it as soon as possible. That’s the only way forward, and no amount of evasion or perception management can serve a company that has made a mistake it’s not willing to admit or take responsibility for. In fact, it costs more to fabricate a lie than it is to own up to a truth. Benihana needs to apologize to Mark for the way they handled his review, they need to drop the lawsuit immediately and offer any compensation as a result of their actions. That’s the least they can do to apologize. 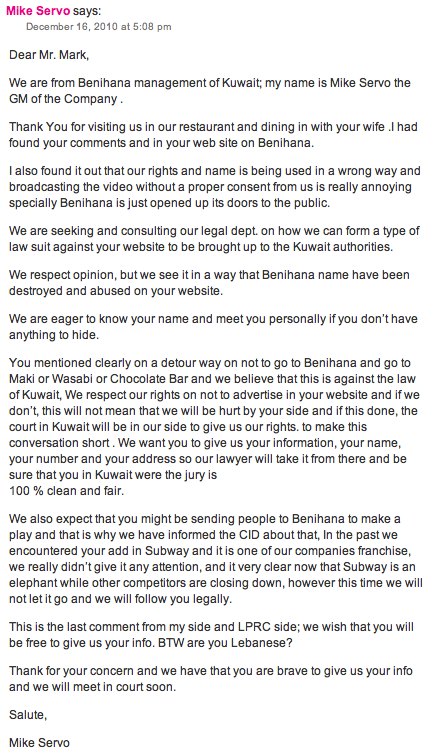 And it’s up to Benihana to decide what more they can do to turn this negative customer experience into a great one. What’s your take on this whole incident? And will it influence your decision to visit Benihana? UPDATE: Mark posted the court order on his blog. LOL, WTF happened to “Customer is always right”?!! And what’s with that action?!! Seriously, WTF?!! What Mark did was 100% okay, he posted a REVIEW on HIS blog! It’s his blog, he has the right! way they deal with customers! Oh wait, please don’t tell me they’re gonna sue me too for this comment! Oh, forgot to mention that I don’t follow Mark’s blog, so the way I respond is based on the facts. I would side against Mark if he was wrong, but he ISN’T! This incident will go down in history as one of the worst examples of brand management. I’m still trying to make sense of it all, and I have to admit that it’s hurting my brain! Their response was disgusting! With a simple elegant tactic they could’ve ended it nicely with mark.. Like inviting him again to the restaurant offering him free dishes ( well cooked), listening to his criticism, and would impeove it too, making him feel heard and his comments welcomed, this way would win Mark loyalty and his fellow bloggers too.. Personally i will never try it out after all this, and I will not recommend it to anyone! Thanks for sharing your thoughts, Noon! It’s unfortunate that commonsense isn’t so common. Otherwise businesses like Benihana could’ve avoided such ugly mistakes. I’ve been following the news about this incident and i can see that your post covers almost everything. I was wondering why does he ask if mark was Lebanese? I totally agree with the part that they should apologize to mark and all bloggers for annyoing us with such silliness! I think the lawsuit is about mark posting a video without permission! does that count? How does he know that takin photos or videos is banned there? should we sign something before entering? haha! What about those who say that mark did this bcuz Benihana refused to have an ad in his website! I have heard that Benihana emailed mark to visit and review the restaurant and that he asked them to be wise enough to post an ad but they didn’t wish to do so. Therefore, he wrote a bad review! I know this sound so silly but thats what i heard and i don’t really believe it mark is way smarter and wiser than this..
1- Why does he ask if Mark is Lebanese: He may have wanted to know if it would be easy to win against Mark in a lawsuit, as he can exclude the possibility that Mark belongs to a prestigious Kuwaiti family. Or it could be that he has an impression of Lebanese people and felt that Mark fit that impression. One running theme I noticed in the comments is that of being an expat trying to make a living in Kuwait, and the GM felt Mark should have respected that, seeing that he’s an expat, as well. 2- Posting a video: The GM wouldn’t have objected to the video if it portrayed Benihana in a positive light. But seeing how Mark was disappointed with the chef’s performance, the GM found the video annoying. Again, the GM is concerned more about his restaurant’s image than the customer experience. 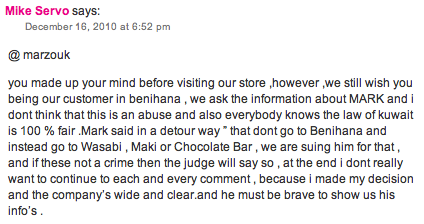 3- Writing a bad review for revenge: I’m not actually siding with Mark against Benihana. I want what’s best for both parties. 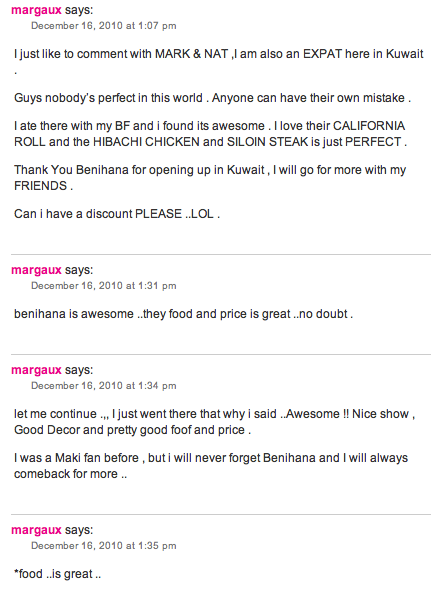 The way Benihana responded has meant that they’re compromising Mark’s happiness and their own success as a restaurant. I want them both to be happy and prosper from their relationship. So, even if Mark was blackmailing them to advertise on his site in exchange for a positive review (which would be a dishonest thing to do), they should not have responded the way they did by posting fake reviews, publicly attacking Mark, accusing him of working for their competition and issuing a lawsuit. Companies should focus on doing the right thing, even when they are victims of blackmail. But I’m not accusing Mark of such practices. Interesting points thanks.. I hope this issue gets resolved as well. But am totally taking Mark’s side because we as bloggers can be affected by this in the future! I do believe Mark is wronged and I’ll be supporting him in this case. I meant I don’t want Benihana to lose or suffer. I want them to correct course. You’re right. Customers aren’t always right. However, the aim of a good company isn’t to prove customers wrong, but to find ways of satisfying them. Business can become very hostile and confrontational. It’s my word against the customer’s word. And a lot of employees and customers engage in this hostility. The point of creating great customer experiences is that you defuse this tension and to side with your customer. He doesn’t want broccoli and he didn’t know what the name of the dish he wants is called. So how can you find out what he wants and offer it to him? You’ll realize that when you side with the customer rather than become defensive you’ll win the customer over. Sure there are many customers who will want to get as much as possible for as little as possible, without any consideration for the companies they are dealing with. But you’ll find many customers eager to support you and help your business succeed when you make them feel comfortable and welcome.